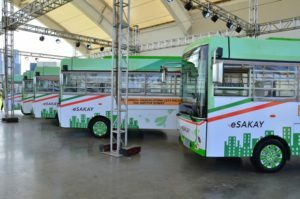 eSakay has finally unveiled the electric vehicle (EV) fleet that will service commuters traversing one of Metro manila’s busiest routes. Held at the Circuit Events grounds in Makati last January 18, the event saw the 15 e-Jeeps that will operate for the Buendia MRT Station-Mandaluyong City Hall via Jupiter St. developmental route. 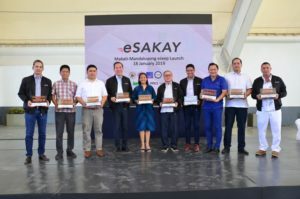 Incorporated in 2018, eSakay is an end-to-end electric solutions provider with a goal of addressing the country’s transportation concerns. It also aids in the Department of Transportation’s (DOTr) gradual shift to its 2017 Public Utility Vehicle Modernization Program (PUVMP). The modern e-Jeeps launched are 100 percent electric and emission free. These eSakay electric vehicles are compliant with PUV innovations–equipped with side entrances, onboard Wi-Fi, an automated fare collection system, GPS tracking system, CCTV cameras, USB ports for charging. The service will also prioritized seating for senior citizens and persons with disabilities. In addition, the PUVMP ensures that drivers and operators have stable, sufficient, and dignified livelihood. The eSakay team worked with the Makati and Mandaluyong LGUs to conduct community-based hiring for the route. They also had discussions with transport associations in the area. Present during the event were DOTr Undersecretary for Road Transport and Infrastructure Mark De Leon, Land Transportation Franchising and Regulatory Board (LTFRB) Chairman Atty. Martin Delgra III, and DOE Assistant Secretary Leonido Pulido III. Makati City Mayor Abigail Binay, Makati City Vice Mayor Monique Lagdameo, and Mandaluyong City Administrator Ernesto Victorino also graced the event. Also there to witness the launch were Meralco Chairman Manny V. Pangilinan, Meralco PowerGen President Rogelio S. Singson, Development Bank of the Philippines President and CEO Cecilia C. Borromeo, and Philippine Racing Club, Inc. President and CEO Simeon S. Cua.